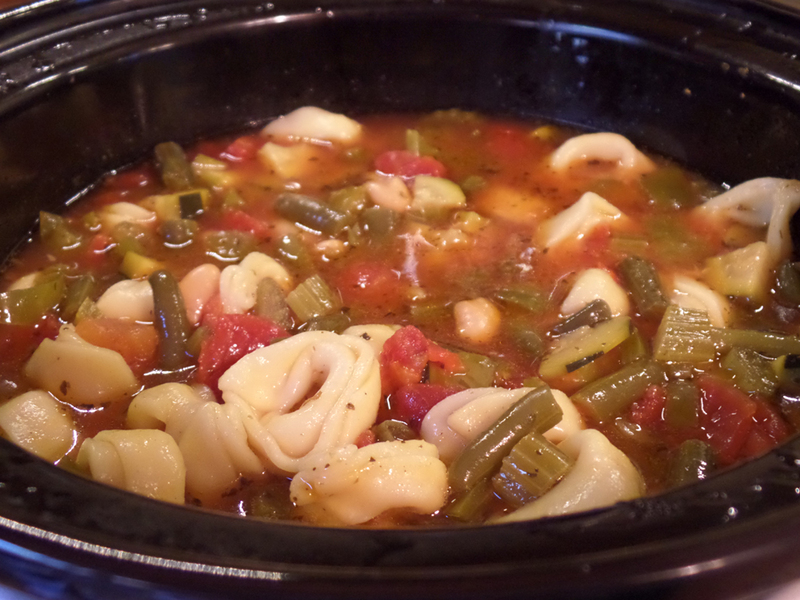 We absolutely loved this slow cooker soup – Dave said it was my best slow cooker soup ever! It’s chock full of healthy veggies, like awesome zucchini, and has the creamy tortellini for a unique flavor. Don’t skimp on the diced tomato can – make sure you get the one that has basil, garlic, and oregano in it for FULL flavor! Instead of the onion, I added more bell pepper and celery. I couldn’t find navy beans in a can so I subbed red kidney beans. 1 package (9 oz) refrigerated sausage or cheese tortellini pasta (I used frozen cheese tortellini and let it come to room temp). Heat oil in large skillet over medium-high heat until hot. Add bell pepper, onion, and celery. Cook and stir 4 minutes or until onions are translucent. Transfer to slow cooker. Add tomatoes with juice, beans, zucchini, green beans, broth, and garlic powder. Cover, cook on low 7 hours, or high 3.5 hours. (Your slow cooker will vary). 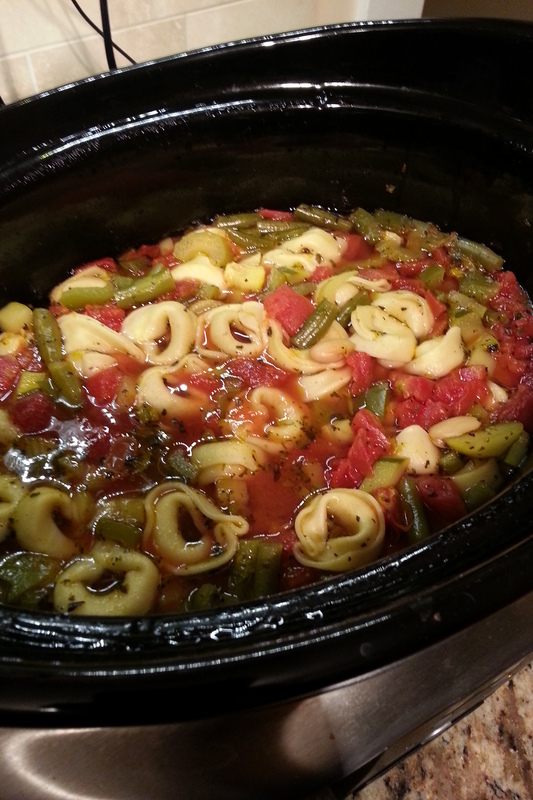 Turn slow cooker to high, add tortellini and cook 20 -25 minutes longer or until pasta is tender. Stir in basil. Garnish each serving with cheese. What a unique dish! This is definitely a recipe that you could tweak to your liking. 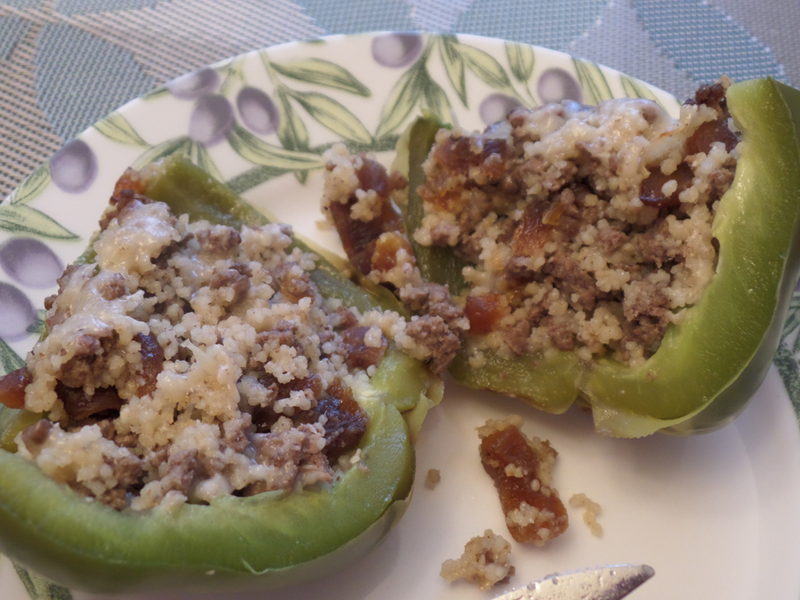 I like apricot flavor but we noticed we didn’t love a full 1/2 cup of them in the peppers. We’ll add apricot in the future, just less. 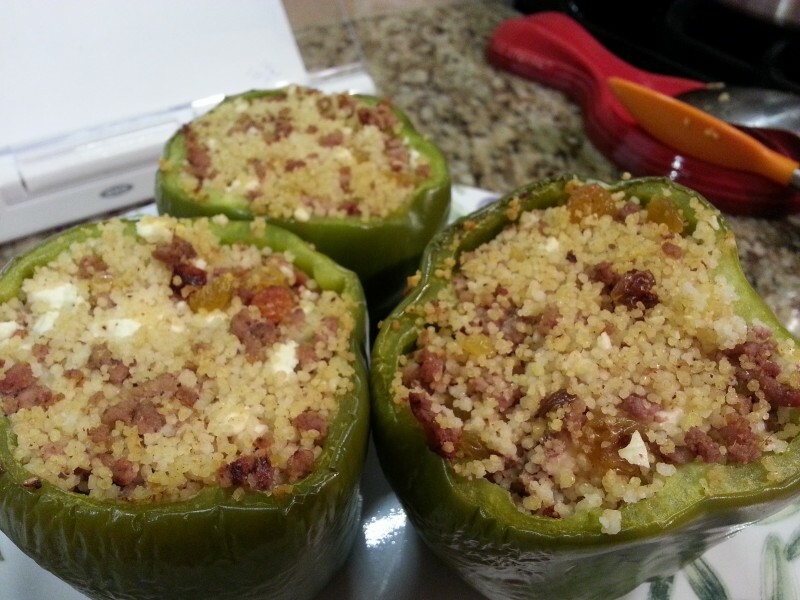 Yummy recipe and it’s interesting to see a pepper recipe without a tomato-based sauce! Brown 1/2 lb. ground beef. Cook 1/2 cup couscous according to package directions. Mix the beef, couscous, 4 sliced scallions, 1 cup crumbled Feta, and 1/2 cup chopped dried apricots; season with salt and pepper. 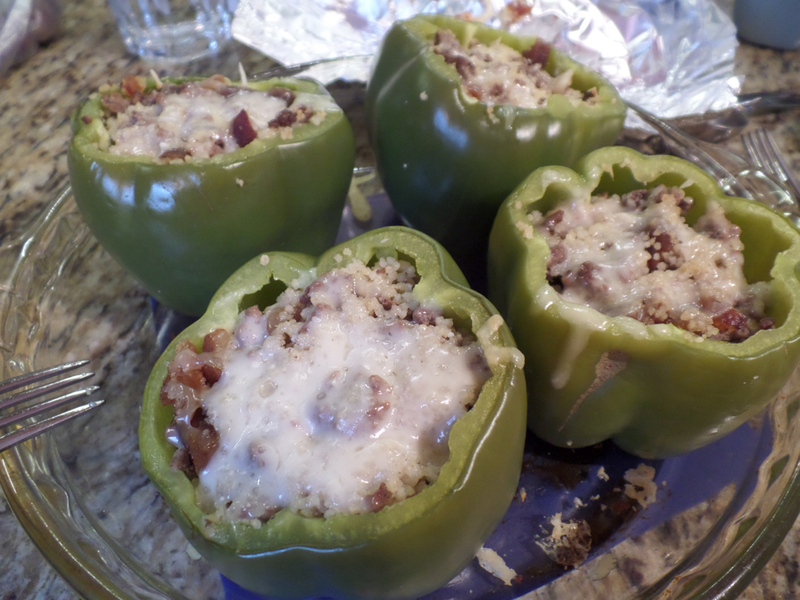 Stuff mixture into 4 hollowed-out bell peppers and bake at 400° F, covered, until tender, 45-50 minutes. 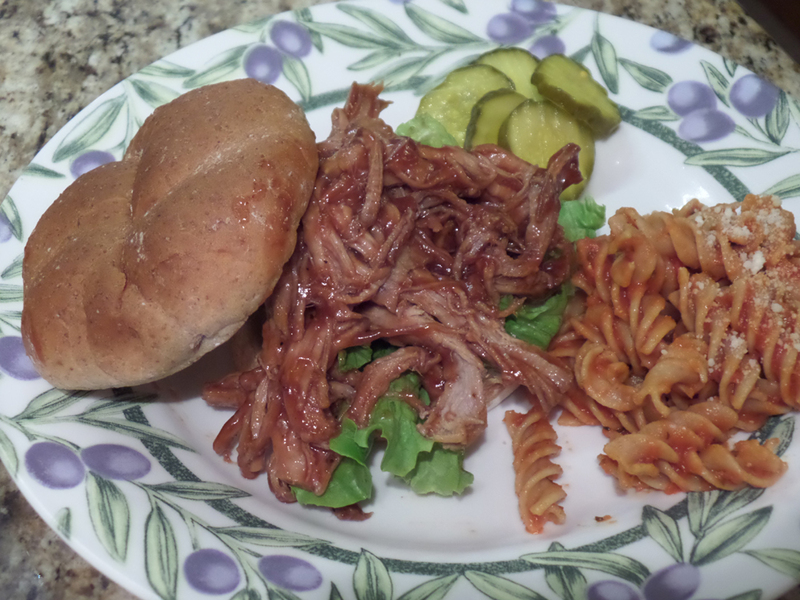 This is such a simple pulled pork recipe! It only works with regular root beer, not diet. So it’s the only time you’ll see regular pop in my house. It turns out beautifully! The recipe says you can make it with a pork loin roast, but I had tried that previously and noticed the tenderloin shreds MUCH easier! 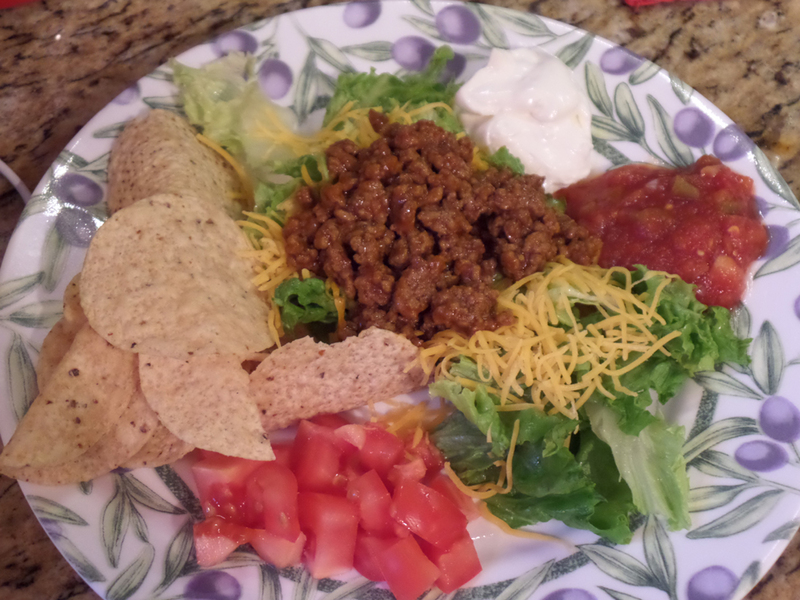 Leftovers are just as good as the main meal! We used Sweet Baby Ray’s “Original” sauce, my favorite BBQ sauce, even though it’s not the healthiest one, it’s one sacrifice we make because we love it. You could use any BBQ though. ENJOY! Place the pork tenderloin in a slow cooker, pour the root beer over the meat. Cover and cook on low until well cooked and shreds easily, about 6-7 hours. (Pork should get to a minimum temperature of 160 degrees to be safe, though the USDA said it can be 145, I go with 160 minimum). The length of slow cooker time varies by your slow cooker. Drain well. Stir in BBQ sauce.